So this is my take on Modrons, in 4e forums. If you don't know what a Modron is, go google it now. I want Modrons to be effective. I want a logical progression in power. Some Modrons have a winged variation, but I don't want to make too many blocks. I will instead create a simple adjustment that can be applied on the forums. I want Primus to be a campaign ending threat. I want to bring back the original psionic capabilities the Hiearchs had, without contradicting this flavor in the Bases. 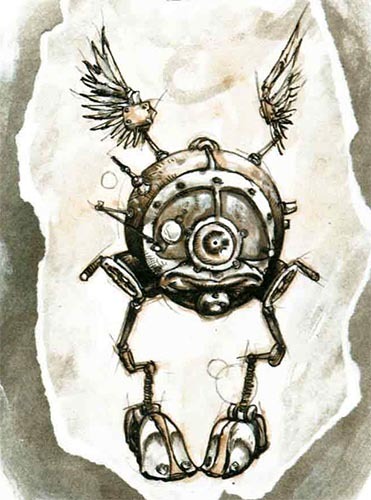 I want to provide a good Exiled Modron stat block for 4e. I prefer to give a complete product, and thus I am going to include a way of fitting Modrons into three different campaign settings: Points of Light, Eberron, and Dark Sun. The only reason I am not including Forgotten Realms is I do not know the setting very well. 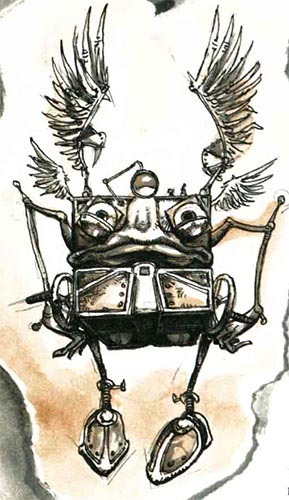 The existence of the Clockwork Nirvana of Mechanus was first hinted to in Psionic Power, in a small sidebar on page 91. I have reproduced it here to use as a basis of where Modron's fit. This plane of reason would be the Clockwork Nirvana of Mechanus (Nirvana is a state of being of being free from "suffering"). The sidebar states that beings of this plane are entities of "pure thought" and "the mortal mind is incapable of comprehending... their true form. As a result... [they take a form] of governing crystals of perfect geometric shapes." 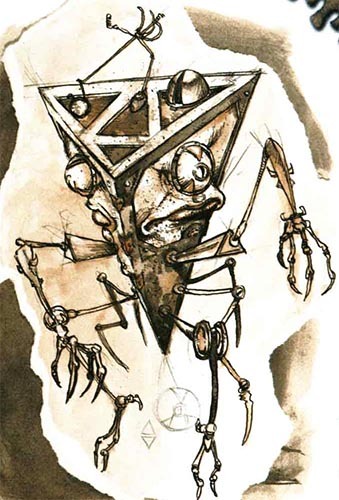 This is the true form of a Modron, the Essence of the Energy Pool too which they all come from. 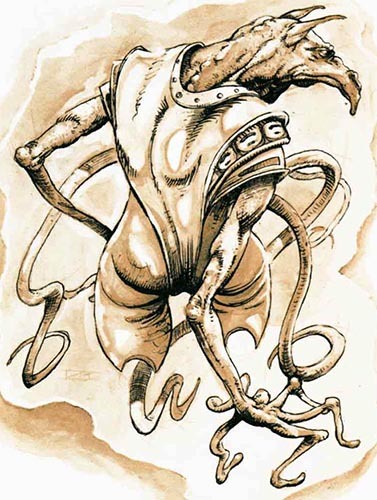 However, such a form has many disadvantages - it cannot interact with other beings very easily, or seek to solve problems on the mortal realm. Too this end, they have convinced an order of Psions to create Construct forms for their servants, the more powerful Hiearchs being able to create a Construct form of their own, if they ever need to leave their realm. These beings of pure reason are thus able to explore the mortal world secretly, and aid in the battle against the ultimate chaos - the Far Realm. However, they feel their existence must remain a secret: just as the forces of chaos corrupt Mortals, their own presence may have an adverse effect on Mortals. Thus, it is unlikely they will ever institute a march unless it is absolutely needed. In this world, a rogue Modron is one that has been somehow corrupted and cut off from Nirvana. Free to explore for themselves, they are always moved to a standard construct body, resembling a Quaddrone. 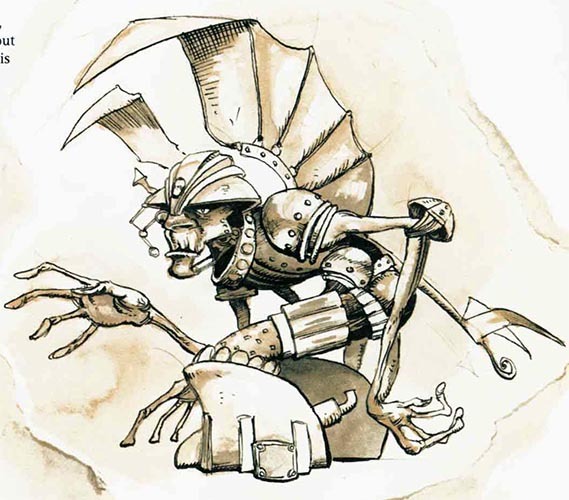 Very few rogue Modrons are ever corrupted enough to actively oppose Primus, but in the rare cases they are, they usually become some of the Modron’s greatest enemies. Modrons hail from Daanvi, the Perfect Order. Created to serve the angelic representative of Aureon, Primus was imbued with part of the Gods power. Modrons act as a sort of all purpose tool: In the event of an invasion, they repair the plane, act as soldiers, and in times of peace, act as inspectors. Very recently, Modrons have started to have dreams, ending up in Dal Quor. 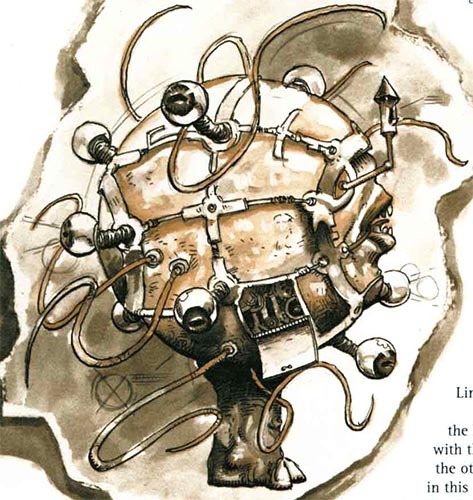 Primus has sent such Modrons, known as “Exiled Modrons” to Eberron, to learn more of what is happening to the Modrons, under the assumption Syberis is calling the Modrons to a greater destiny. Modrons are a force unknown to most of Athas. Ancient inventions of the Halflings from the time of the blue age, Modrons started as simple stone and leaf constructs, but with the ability to create, and enhance, themselves. As the world progressed, they moved to be hidden deep underground, fearing the other races, where they slowly set up the society known today. Recently, they have sent up a few drones to figure out if the surface world is at a point where they would be able to survive, or if the surfacers need their help. No drone has returned, and they do not know why. Modrons could be an ancient threat that can upset the balance of Dark Sun, or they could instead be a force that puts the rule of the Sorcerer Kings into absolute certaintly, ensuring order is achieved. 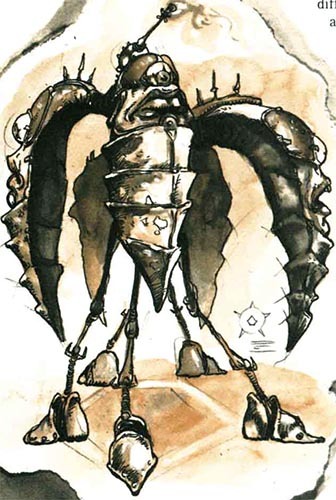 In Dark Sun, an exiled Modron is only different from any other Modron in that they were selected to scout the surface. Last edited by Gralamin on Wed Feb 23, 2011 9:00 pm, edited 3 times in total. Beings of law, freshly introduced to chaos. Average Weight: 300 lb - 300 lb lb. Living Construct: You are a living construct. You do not need to eat, drink, breathe, or sleep. You never make Endurance checks to resist the effect of starvation, thirst, or suffocation. All other conditions and effects affect you normally. Unsleeping Watcher: You do not sleep and instead enter a state of inactivity for 4 hours to gain the benefits of an extended rest. While in this state, you are fully aware of your surroundings and notice approaching enemies and other events as normal. Durable Body: Your body is more durable than normal. At character creation, choose Acid, Cold or Fire. You gain Resistance of 2+One-half your level to that keyword. Standards Compliant: Exiled Modrons count as Warforged for the purpose of Warforged Components. You reorder the world around you. Target: All allies in burst. Effect: You slide each ally one square. In addition, you may attempt to aid another an ally in the burst as a free action. Exiled Modrons are beings of pure order and logic, which have been corrupted by Chaos. They search through existence for a way to reconcile this new existence, and the new concepts that come with them. To be logical, quirky, and strange. To live in a world that is very strange compared to what you are used to. 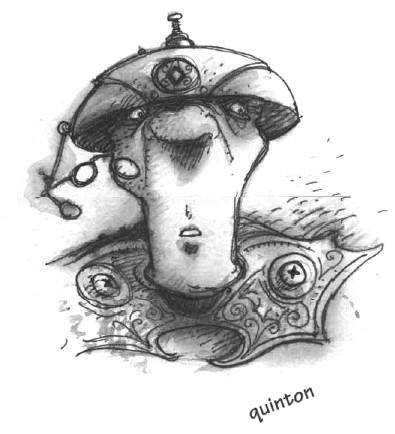 To be a member of a race that favors Artificers, Psions, and Wizard classes. 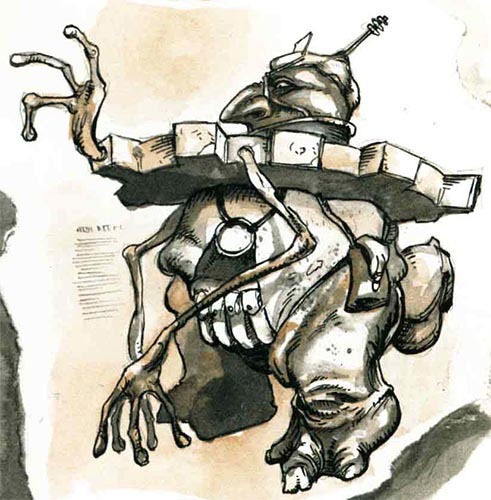 Exiled Modrons are bipedal creatures with a precise cube forming most of their body, except their arms and legs. This cube is both their torso and their face. Their metal bodies have precise clockwork interiors. 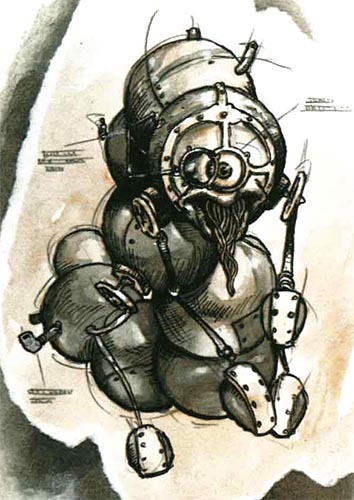 Exiled Modrons have fully featured, humanoid hands, while their feet are more of a shoe shape. 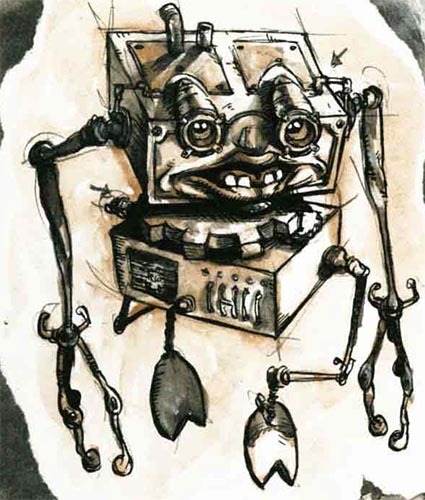 Exiled Modron heads cover the front of their cube, They have large eyes, no visible nose, and either a flat, humanoid mouth or a beak like mouth. No Exiled Modrons face is the same, and other then their coloration, is usually the only way to tell them apart. Exiled Modrons posses vestigial wings, which have no game effect. Exiled Modrons do not have a concept of gender. They do not reproduce. Like Warforged, Exiled Modrons are able to modify their body to an extent, allowing them to use Warforged Components, though few choose to. Exiled Modrons only feel pain from deep injuries. Exiled Modron’s emotional range is odd. Most have not yet experienced the full range, but all can feel pain, anger, and curiosity. As a habit, most Exiled Modrons attempt to analyze each new emotion they experience, trying to fit it in the mental picture they have of emotions. Few Exiled Modrons are able to feel more then one emotion at once, though they can feel an emotion made up of multiple (for example, they can feel Love, which is made up of Happy and quite a few other emotions, but they cannot feel Angry and Afraid at the same time). Exiled Modrons are usually either pensive, or very vocal of their experiences. Many Exiled Modrons end up in communities with individuals of similar mindsets, or of completely different mindsets. Exiled Modrons often form philosophies and discard them. No Exiled Modron wonder about their soul, each one knows that on true death, their corruption will be erased and they will rejoin the energy pool from which all hail. Exiled Modrons usually have very few experiences in the world. Exiled Modrons keep busy, if not with work, then with many projects they work tirelessly towards completion. Many take Pride in their work, but do not mind failure, learning as much from it as from success. Exiled Modrons come from a society that duty, chain of command, and other hierarchical concepts are a way of life, and understand it better then most creatures. Exiled Modrons in fact usually have problems with working outside their assigned orders in the real world, the idea of taking initiative and risk being new and foreign to them. Exiled Modrons do not refer to themselves with any gender pronoun, preferring a general pronoun of “One”. Exiled Modrons often give each person in their group a designation, from which they will often derive a nickname for an individual. Interestingly, many Exiled Modrons form similar nicknames for the same individuals. 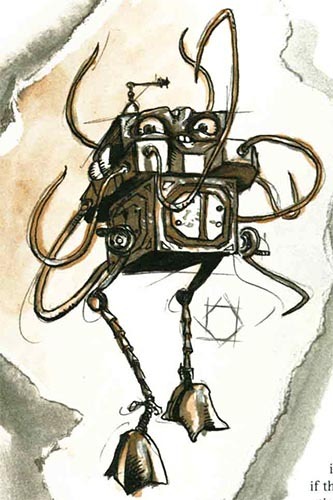 Exiled Modron Characteristics: Quirky, Impulsive, Calculating, Naive, Clever, Perceptive, Methodical, Practical. Exiled Modron Names: Exiled Modron names are usually quirky, and embody some feature of them, such as part of their designation, the fact they are outside normal order, or the first emotion they felt. Some examples include: Nordom, Binary, Two, D-67, Chi-52, Anger, Sorrow, Curiosity, User, Prompt, Actor. Last edited by Gralamin on Fri Dec 31, 2010 9:54 pm, edited 1 time in total. Psionic characters are not the only servants of Modrons, many warlocks have sought the Modrons out for power. These Clockwork Warlocks, as they are commonly called, can draw upon the power of ideas and Nirvana, much a like to Psions. Most Warlocks of this pact also learn something of the mind, and usually multiclass with a psionic class. Many Warlocks of this pact are called by their master to a number of different tasks. Thus, they work well in the front lines or in the rear. With the firm foundation of order, many of the powers of this pact aid allies, as well as hinder enemies. When you choose your Eldritch Pact, you can choose the Clockwork pact instead of another option. Clockwork Pact: You have pledged yourself to the service of the Modrons. In return, Primus transformed you into a powerful spellcaster by imbuing knowledge directly into you. What you do with your power is thus up to you, the knowledge is all you need to use it. Eternal Gears: You gain the eternal gears power. Primed: You have the Primed pact boon, which enables you to draw on powers similar to psions, increasing the might of your powers. You start each encounter with a single point primed. You must decide whether or not to use any of your primed points when you choose to use a power, before you make any attack rolls or apply any of that power’s effects. You cannot use more primed points then you have. Ritual Casting: As part of this pact, you gain the Ritual Casting feat for free. Clockwork Warlocks require a great deal of stamina to use the power imparted to them, and so Constitution should be their highest score. Intelligence should be your next highest, because many powers gain benefit with increased understanding of the spells. A good third choice is Charisma, as it enhances many good multiclassing options, allows you more power choice, and increases your will defense. These powers are associated with the Clockwork pact, but they also provide warlocks of other pacts with new options. They are ideal for Constitution based Warlock builds, such as the Vestige Warlock and Infernal warlock. The gears spin for eternity, and your opponent will never be able to reach you. Hit: 1d8 + Constitution modifier psychic damage, and the target is slowed until the end of your next turn. In addition, the target takes a -2 to all defenses against your attacks. Primed: If you spend one point you deal an extra 1d8 damage. If you spend two points, you deal an extra 1d8 damage and the target is immobilized instead of slowed. Special: This power may be used in melee or ranged. If used in melee, it has the weapon keyword. If used at range, it has the implement keyword. It may be used for a Melee basic attack. You launch a well tuned assault at your foe, lighting them afire with the strength of your allies. Hit: 1d8 + Constitution modifier fire damage. In addition, the target takes 5 extra fire damage for each ally adjacent to them. Primed:If you spend two points you deal an extra 1d8 damage. If you spend three points, each ally within two squares of the target may shift one before or after the power. You launch a barrage of attacks at a foe, allowing you to slip by less important foes. Hit: 3d8 + Constitution modifier psychic damage. Primed: If you spend two points, you may teleport Constitution Modifier squares. If you spend four points you are treated as insubstantial by minions until the end of your next turn. You have learnt some interesting tricks. You cunningly trap your foe in a series of attacks. Hit: 3d8 + Constitution modifier Acid damage, and the target is slowed (save ends). Effect: Until the target starts his turn not adjacent to you, you may make a melee basic attack on the target, with a power bonus to damage equal to the number of allies adjacent to the target. Primed: If you spend three points, you may teleport Constitution Modifier squares before the attack. If you spend four points the opponent is immobilized (save ends) instead. You are better at rituals then most casters. Effect: You gain a +5 bonus to any check you make as part of this ritual. This power may only be used once per ritual. Your strikes become stronger as you keep hitting the same foe. Effect: When you hit an opponent, you gain a +1 stacking bonus to damage against that opponent. If that foe is cursed by you, you may forgo a die of curse damage to increase the bonus to damage by two instead. This bonus cannot increase past half your constitution modifier. If you miss an opponent you have a bonus from this effect from, decrease the bonus by 2. Primed:Spend any amount of points: The damage cap is raised by half that number. You intuitively can sense those who would stand in your way, and avoid or confront them. Effect: Any creature you can see that intends harm to you or your allies glows a light red color while this power is in effect. If a creature is invisible, but not hidden, they will also glow if they intend harm to you or your allies. This power lasts until the end of your next turn. You have redesigned the ritual to be more efficient. Effect:Reduce the time and cost of this ritual by 20%. This may not reduce the time below 3 rounds, or the cost below 50%, and may only be used once per ritual. Reality splits as an army of Modrons start marching through the world, destroying your enemies on their way. Effect:You create a zone in the burst. Until the end of the encounter you are stunned. Losing the stun condition immediately ends the zone, as does knocking you unconscious or killing you. Any enemy that starts it’s turn in the zone is restrained until the end of their next turn, takes 5d6 + Constitution modifier psychic, fire, acid and cold damage, and has a -2 penalty to all defenses until the end of their next turn. At the beginning of your turn, you can move the zone as a non-action, 5 squares. Primed: If you spend fives points you are dazed instead of stunned for the encounter. If you spend ten points, you are not stunned or dazed for the encounter from this power. You may still be stunned or dazed from another effect. Last edited by Gralamin on Fri Dec 31, 2010 10:52 pm, edited 5 times in total. Feats will be split into: Clockwork Warlock feats, and Exiled Modron feats. Warlocks need one at paragon and epic to increase starting amount of primed. Last edited by Gralamin on Sat Jan 01, 2011 12:47 am, edited 4 times in total. Mododrone gains +1 to all defenses for each other Monodrone adjacent to it. Hit: 1d8 + 8 damage. Hit: 1d8 + 8 damage and the target is marked until the Duo-drone marks another creature. Hit: 1d8 + 6 damage and the target is knocked prone. Effect: The Duodrone shifts it's movement. Effect: Switch positions with an adjacent ally, or a prone foe. Last edited by Gralamin on Sat Jan 01, 2011 10:20 pm, edited 4 times in total. Last edited by Gralamin on Sat Jan 01, 2011 9:04 pm, edited 1 time in total. Immune fear, charm; Resist 20 radiant, 20 necrotic, 20 acid. Primus cannot be surprised and Primus does not roll initiative. He has three turns each round, and he chooses when in initiative to act. Primus' acions refill each turn, even immedate actions. Any allied minion in the aura uses Primus' Defenses, and attacks with a +40 bonus to hit. At the start of Primus's turn, if there are fewer then 12 allied minions alive, he summons up to 4 pentadrone minion in 5 squares of him. 4d8 + 14 radiant damage, and the target is teleported to the Astral Sea (save ends). While in the Astral sea, the target can take actions normally. Hit: 4d8 + 14 necrotic damage, and the target is teleported to the Elemental Chaos (Save ends). While in the Elemental Chaos, the target may take actions as normal, but suffers 10 fire, acid, cold, or electricty damage a turn (roll 1d4 to determine damage type). Effect: Primus makes a Touch of Law attack and a Touch of Chaos attack. Hit: Target is submerged in the energy pool. Remove target from play (save ends). Place a Logic Construct in play where the target was. The Logic Construct leaves play when the target returns to play. All damage dealt to the Logic Construct is dealt to the target removed from play. The Logic Construct acts on the target's initiative. Special: While a Logic Construct is in play, this ability may not be used, unless it is used through Flawless Logic. Effect: Allied Modron gains +2 to all defenses, +20 HP (If a minion, it can survive 1 more hit then normal), and +1 to attack and damage, until the end of the encounter. Allied Modron cannot be used on the same Modron twice. Effect (Free): Primus makes an Inevitable Logic attack against each opponent within range. Logic constructs never take damage, instead transferring all damage to the creature they were created from. Last edited by Gralamin on Sat Jan 01, 2011 10:15 pm, edited 7 times in total. That is all the reserved posts I need. Feel free to start sharing ideas, comments, critism, etc. You can see a lot of my plans already. First draft of Primus up. He will probably have to be weakened. His ability to constantly remove things from the battle constantly gives too large of an advantage. Note to anyone who may happen to be watching / reading: This project has been delayed, due to Internship finding taking up my time. It should resume soon though. I think the encounter power is too good. Get rid of the option of aiding an ally, and let it only slide a maximum of two allies in the burst with it, and it would be more balanced, I think. Slide 1s are really valuable, and having an AoE slide 1 encounter power that also has an additional benefit is too much. Otherwise, I think they're alright, although they get more cool stuff that warforged, that cool stuff is not as mechanically potent as the Warforged's "autosave vs. death", so its probably about right. I might look at the new warlock build later, but I am intrigued by the concept. I skipped most of the monsters, I might give them a second look later. But looking at Primus, I have to say that even for a 34 solo, he's too good. Played by even a tactically novice DM, Primus will only be fighting half the party at any given time because every power he has banishes the target, pretty much. Those that are not banished are being swarmed by an endless number of souped-up minions that are worth 0 XP. I would make Touch of Law restrict their encounter & daily powers for a round and do radiant, while Touch of Chaos does multiple elemental types of damage and gives them ongoing 5 or 10 damage - that would give him his flavour of control and imposing limitations without making him too over-the-top. I would also recommend toning down his auto-swarm of minions, and changing Inevitable Logic to something that does not banish. Maybe make Mental breakdown single target, at-will, and make Inevitable Logic the encounter power? Then you could leave it as banshing, that'd be alright, and bloodying him could recharge it. Finally, I would lower the recharge rate of his AP-copying ability to 5 or 6, that's a really good ability, especially since he has three times as many chances to recharge it as a normal monster does. Overall, cool project, looking forward to seeing more! Well the two things they really get that Warforged don't is: They save easily against illusions, and they have some resistance. Definitely not as good as autosaving vs death. As for the racial power, yeah it's still in the testing phase. I tend to start with more powerful concepts, and nerf them down, as I find that taking away pieces and slimming it down is easier then adding on something. That said, I'm not sure whether or not the Modron racial power is too much just with the slides. I'll have to do some tests. I skipped most of the monsters, I might give them a second look later. Still carefully considering what to do with most of them. Combine that with having other important things to do, and it delays me quite a bit. But looking at Primus, I have to say that even for a 34 solo, he's too good. Played by even a tactically novice DM, Primus will only be fighting half the party at any given time because every power he has banishes the target, pretty much. Those that are not banished are being swarmed by an endless number of souped-up minions that are worth 0 XP. I would make Touch of Law restrict their encounter & daily powers for a round and do radiant, while Touch of Chaos does multiple elemental types of damage and gives them ongoing 5 or 10 damage - that would give him his flavour of control and imposing limitations without making him too over-the-top. I would also recommend toning down his auto-swarm of minions, and changing Inevitable Logic to something that does not banish. Maybe make Mental breakdown single target, at-will, and make Inevitable Logic the encounter power? Then you could leave it as banshing, that'd be alright, and bloodying him could recharge it. Finally, I would lower the recharge rate of his AP-copying ability to 5 or 6, that's a really good ability, especially since he has three times as many chances to recharge it as a normal monster does. Well, the current incarnation of Primus is close-ish to his 2e representation. I know he is far too strong, and I will be nerfing him down. However, he may be a bit stronger then some gods: They have their invincibility to fall back on. He does not. I'm not going to address specific power comments until I have a better idea of how I want him to finally look like. Okay, I have had a chance to start reading the Clockwork Pact Warlock, and I am pretty sure it is too strong. First off, the pact is identical to the Sorcerer King Pact mechanically (except Dark Sun calls it a "fell might" instead of a "primed point"), with the key difference that Clockwork Pact Warlocks have a cap of CON, while Sorcerer King Pacts have a cap of 1. The ability to spend 1 point to augment the damage on the at-will power by d8 is also identical. However, the Clockwork pact's powers quickly outpace their Sorcerer King counterparts because of the ability to gain more features by spending extra points the SK pact doesn't have. However, I like the idea of winding up a clockwork mechanism for the pact boon, and its workable. You could start each encounter "wound", which gives a bonus to damage rolls, or perhaps a bonus to Warlock's Curse. When you are hit by an attack, you become unwound, losing the benefits - when your pact boon triggers, you become rewound again, and continue to gain its benefits. Feat support could then be focused around increasing the virtues of being wound. Anyway, I really like the flavour of this pact, I just think that in execution, it is a bit on the strong side - but like you said, it is easier to overreach and then scale it back than to lowball it and have to finagle more features into it. Note this is still ongoing, even in light of This article. I promise I'll have time to work on it soon, and I might build off the official article. Suspended for now. Going to try re-doing it from scratch, and posting up a more complete form.